Siri was perhaps the most buzzed about part of the most recent iPhone release, but users say that the built-in digital personal assistant doesn’t want to help out when asked about abortion services. 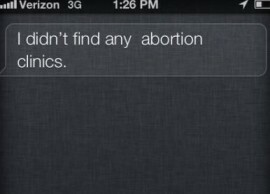 Somewhat more disturbingly, however, is that Siri seems to skim over local abortion providers in favor of what are known as Crisis Pregnancy Centers (CPCs.) The “abortion alternatives” organizations are a well-known nuisance to organizations like Planned Parenthood, next to whom they often set up shop and offer free pregnancy tests to walk-ins and urge women not to abort when confronted with an unintended or unwanted pregnancy. The centers have been criticized often for attempting to hold sway over a woman’s decision to terminate a pregnancy and influence her with promises of easy-to-arrange adoptions and assistance in raising a child, often offering up ultrasounds and dated medical advice to prevent women from seeking and obtaining the procedure.